After a particularly cold February and start to March we have experienced some periods of better weather during the start of the season. Despite fairly good conditions during the first two nights that we were able to open the nets, the first two nights produced zero owls and we were quickly dreading a potentially very slow March. Thankfully, and much to our relief, a few Northern Saw-whets have begun to move. The first one arrived on March 18, followed by the first little push of 10 on the 19th, and four more on the 20th. March has produced some very mixed results in the past, both in regard to weather and owls. It’s obviously very early in the season, but we have started to get some melt and the first few Saw-whets are moving, so we’re happy about that. 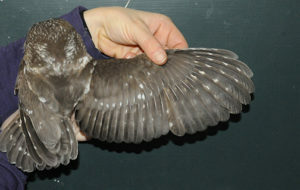 A Northern Saw-whet Owl that had replaced all but one of its flight feathers on this wing in its most recent molt. 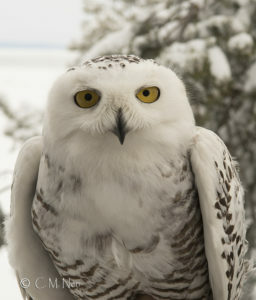 We know that many of you who follow WPBO’s owl banding research are also fans of the Snowy Owl research conducted by Project Snowstorm. Nova and I have been fortunate enough to collaborate with this project the last few years. Although we did not do any Snowy Owl work this winter, we were very excited to hear back from Pickford, one of the owls we tagged with a Project Snowstorm transmitter last winter. Pickford is a female we tagged on February 2, 2018 when she was a young bird spending her first winter hunting rodents in the farm fields near the town of Pickford. Her winter territory was in the same fields that had been the winter territories of the two adult Snowies, Chippewa and Whitefish Point, that we tagged in the winter of 2016. Last year Pickford spent the winter in those fields before moving up onto Lake Superior as the ice began to recede at the end of April. 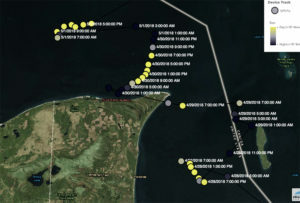 She spent a few days right around Whitefish Point before moving up the lakeshore to Wawa,Ontario in mid-May. She then spent about two weeks crossing Canada up to James Bay before moving out of cell coverage for the summer. Then, in late September she very briefly moved back into cell coverage and we saw that she was on the eastern edge of James Bay almost directly across form the spot she had last checked in from on the western edge of James Bay in late May. Unfortunately her transmitter was unable to download all of the data it had stored up to that point and we waited several more months before she finally hit cell service again. An amazing thing about these cellular transmitters is that they can be programmed to send text messages when they transmit data. We were at Nova’s parents in upstate NY in January when our phone dinged from a text. The message read, “Pickford the SY female Snowy has checked in.” We ran to the computer to download the most recent data and saw that this time the transmitter was able to download all the data it had stored, 11,ooo data points! Where was she? Not in MI, but she had flown SSE from the southwestern edge of James Bay and made a beeline for the Canadian Atlantic coast and was near Prince Edward Island (PEI). We found out she had spent the summer and fall moving all around James Bay before deciding not to return to the UP, but to head over to the ocean. So, after spending her first winter hunting rodents in the farm fields of the eastern UP, she has clearly developed a taste for waterbirds and somehow knew to head out to the Atlantic coast for winter. She is still there, our phone dinged a couple hours ago to let us know that she had checked in once again. 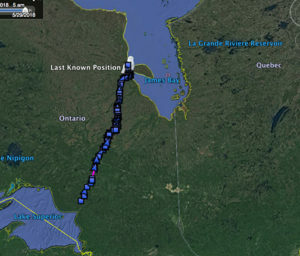 Her northward journey started on April 28 last winter, it will be interesting to see when she heads north this spring. Hopefully we will get to see some of her path before she moves out of cell coverage. Pickford prior to her release in February 2018. Pickford’s 2018 winter territory in the farm fields near Pickford. Pickford’s movements around the Point in late April and early May 2018 at the start of her first spring migration. 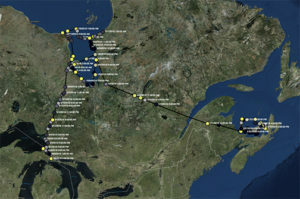 Pickford left Lake Superior on May 10, 2018 and and slowly moved north, arriving on James Bay about two weeks later. Pickford’s full map. 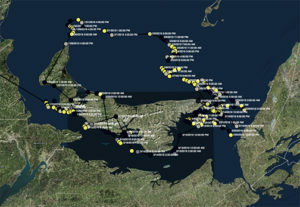 After spending the summer and fall on James Bay, she headed for the Atlantic coast in mid-January. The bulk of this journey took just two days and she reached a speed of at least 44 mph as she headed for the coast. Pickford’s winter territory around Prince Edward Island this year.